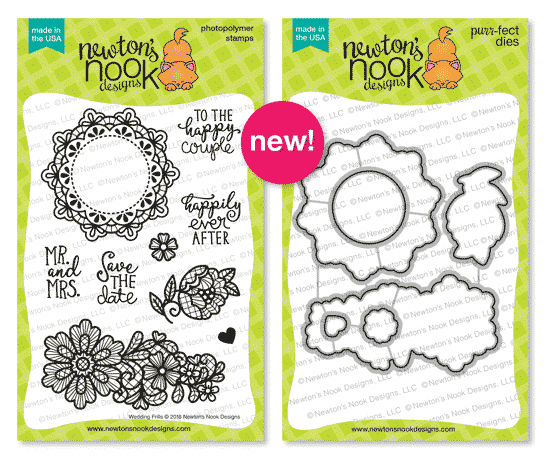 Hollybeary Creations : Newton's Nook April Release Day 2!! 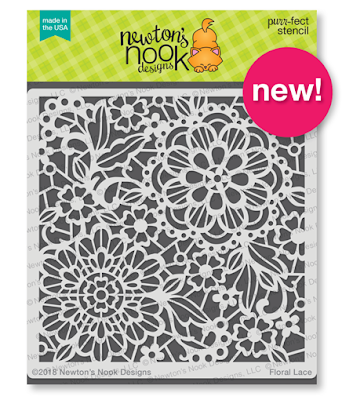 Newton's Nook April Release Day 2!! It's Day two of the April Release sneaks from Newton's Nook Designs and today we are introducing the new Floral Lace Stencil and Wedding Frills Stamp and Coordinating Die set. I created two cards for today... On my first card, I used the Floral Lace stencil on the background with some Grey Distress Ink over a Vanilla cardstock base. Then I die cut a Coral panel and a Vanilla panel using the Frames and Flags Banner die set. I stamped the images onto the Vanilla panel with Grey and Coral inks. Then I adhered the panels to the card front off centered. I die cut some of the flowers and popped them up with foam adhesive for dimension. I went Brighter with my second card... I created a Sugar Plum card base and then I added some White Embossing paste with the Floral Lace stencil. You want to apply the paste a little thicker so it appears White against a darker Background. I set that aside to dry and die cut another piece of the Sugar Plum cardstock using the Wavy die in the Land Borders die set. I stamped the floral image onto the panel using coordinating ink. Then I adhered it to the card front. I die cut the word Congrats using the new Essential Alphabethbet set we released yesterday and adhered that following the curved edge. I die cut a banner from the Frames and Flags Die set and stamped the sentiment using the same Purple ink. I die cut another flower and adhered it with some foam tape. Would you like to win the “Wedding Frills” Stamp Set? These cards are so lovely! I love the fun colors you used and the two ways to create with a stenciled background! Thanks for the inspiration! your pretty cards (esp. the purple, my fave color). WOW ! I love your wedding card, it's stunning ! The colors are perfect. These stamps/dies sets are really a great match with the stencil. This is such a unique set. So creative. Great card! Pretty wedding cards. I really like the color combo on the first one. 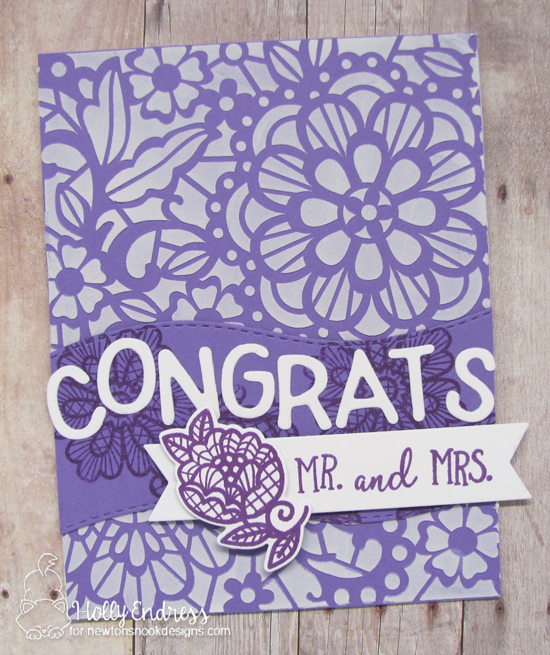 Such pretty cards - love the Floral Lace Stencil. Great use of the stencil...very pretty. I love how that stencil design is dark when you put paste on top of it. Really pretty!! Love your cards, they are amazing! Such sweet cards. I am really liking that stencil. It makes for such a nice background. Love the purples on the second card. the layering on the first is great. Your cards are lovely; I like them both. However, I do think I like the brighter one more. Nice job! WoW! Your stenciled background looks die cut! And I love the green and peach!! What lovely tone-on-tone techniques you've used here! You really combined the stencil and the stamp seamlessly. Thanks for sharing! Love the stenciling on your cards! My favorite is the purple card - probably because that's my favorite color! A great idea kind of doing that negative effect with the stencil and really like the color that you picked.